Kindasophically speaking: Digital Photography - it just gets better! I'm a fan of photography. I don't take good pictures (hopeless!! ), but sure do appreciate great photos and the cool gear that helps capture those photos. And being a photography enthusiast means this is the best time of the year... yeah, Photokina! That's like the E3 of gaming... the Detroit motor show of cars.... the... well, you get the picture. However, in the recent years, the stuff that get dished out at Photokina is nothing to really go ga-ga over. The manufacturers keep on cramming more megapixels into the sensors, they try to out-do each other with evolutionery and me-too features... BORING! But this year, things got really exciting! 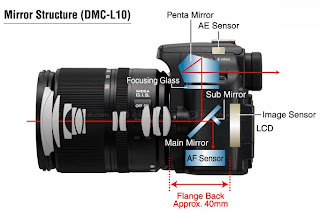 If you read my previous blogs on digital cameras, you'd hear me bemoan (here, here and here!) the tiny and noisy chips in Panasonic Lumix cameras. I had been wishing out loud that Panny woudl stop the silly megapixel race and focus on making their wonderfully small and featurefull cameras with larger and better chips. Here's a side by side comparison of how the conventional DSLR looks like vs the new micro four thirds.... lots of exciting days ahead, when we see how the market responds to this. Already, Olympus is hot on the heels and have also pre-announced their version of the micro four thirds as well! 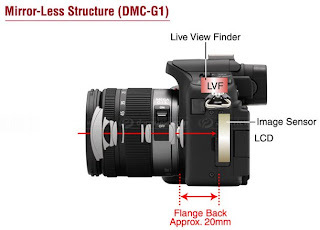 The micro four-thirds DSLR : everything smaller except the sensor! Then, things got even more exciting! Ths SX1 has Canon's excellent CMOS CCD.... with a bonus that it can shoot at a lightning speed of 4 frames per second! On paper... the features are really top notch.... can't wait to test it out when it's finally available here! The only thing is the price.... no idea how much is it going to cost in Malaysia .. but it does look like its going to encroach quite deeply into DLSR country ... and may (hopefully not) end up with a very niche market..? Read more about this amazing camera here, here and here. Sorry, Panny, but I may have a new favourite hottie now.... !! Hi Sting, yeah, some websites have the SX1 priced at about 520 pounds... thats like over RM3k here! Well, I guess hi-tech coolness comes with a price eh? You are NOT ALONE!! My favourite phrase when discussing gadgets with friends is this... we have a very limited means chasing limitless wants!! Its a sure recipe for dissatisfaction! If you want a lot of zoom but don't want to spend a lot of cash... there's Panny's FZ28 or the TZ15... each easily costing less than RM 1.4k. Or check out Canon's baby DSLR, the EOS 1000D. Here's a tip... you can find lenses from 2nd markets for very good prices. I know of friends who start from building their collection with very modest budgets that way. At the other end... you can find loads of very decent point and shoot cameras for below RM 1000. Thanks Lee... that's very kind of you! BTW, I hear you're having loads of fun with your D60 (or was it the 450D?). Interesting, but I'm a Nikon fan. And to answer your question, I use a Nikon D80.